If you are looking to purchase image-based puzzles for your publication, then our memory puzzles could be just what you're looking to buy! The way to play our memory puzzles, like the sample to the right is easy - study the image for a period of time - usually somewhere between 1 - 2 minutes (you can write your own instructions as you see fit) and then turn the page or cover over the magazine and answer the questions. The questions will ask you to try to recall in which sector of the grid various parts of the picture appear. 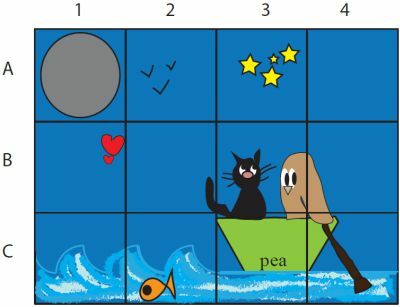 Therefore with the sample puzzle you'll see to the right the questions might ask you which square of the grid the own appears, the cat's tail, and so on. There are usually around ten different elements of the image to recall. These puzzles are both fun and visual, and also suitable for both an audience of children and a mainstream publication too. The number of elements to find can be variable depending on the required difficulty, and you can also specify how long people are allowed to study the images for too to make them easier or more difficult. Artwork can be black and white or colour as per your preferences, and are usually supplied as PDFs but you can choose other formats. If you're looking to buy these memory puzzles for your publication then they can also be themed as required so if you wanted one based around a particular topic just let us know and we'll try our best to create a puzzle just for you. If you are interested in memory image puzzles for your publication, then please Contact Us >> with your requirements and we'll be delighted to send you further information.